I’ve been to many of the largest cities around the world, but I can honestly say that I’ve never been in a city quite like Shanghai! Mind-bogglingly big, mind bogglingly beautiful and complex…and infinitely interesting. With its mix of Chinese and European, old and VERY new architecture…not to mention its 24 million inhabitants, it is definitely a place everyone should visit, at least once! The Association For Manufacturing Technology (AMT) and German Machine Tool Builders’ Association (Verein Deutscher Werkzeugmaschinenfabriken for short) have partnered to launch a new award devoted to industrial 3D printing with a value totaling $100,000. The International Additive Manufacturing Award (IAMA) competition is accepting applications from now until December 31, so, if you’re a 3D printing genius or a team of 3D printing geniuses, get crackin’. 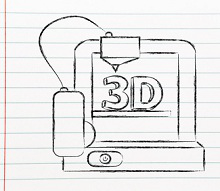 The Inside 3D Printing Conference and Expo is known worldwide as the place to be if you or your company has any interest in the up-and-coming technology of additive manufacturing / 3D printing. With almost a dozen separate shows all around the globe each year, each capable of making anyone feel like a kid in a candy shop, there is no doubt in my mind that this is the premier event within this industry. Whether you are focused on learning about the technology, interested in purchasing a 3D printer for your home or business, or thinking about building a business around this revolutionary technology, it is a destination that one can’t miss. This past weekend, Inside 3D Printing made a stop in Santa Clara, California for the second straight year. The Annual Trip to Frankfurt (Euromold) is Just a Month Away! We are just under a month out from what is arguably the most important event on the 3D printing calendar — Euromold. Taking place a little earlier than usual, from 25th to the 28th November in Frankfurt, EuroMold is largely regarded by the 3DP OEMs as the place to reveal the latest industrial grade tech for additive manufacturing. As the year’s have gone by — the global exhibitors and the increasing number of visitors to Euromold have bought in to this tradition and this year looks like it will be no different. I know for a fact Stratasys have a raft of stuff coming, I’d bet my mortgage 3D Systems will want to up the ante on last year and various other 3D printer manufacturers have all intimated that mum’s the world until the 3D printing world descends on Frankfurt. When the same conference is hosting some of the most renowned and respected personalities in fields as diverse as architecture, gaming design and making you know something important is going to come out of it. In the era of multi-material 3D printing this no longer means just ideas and visions but actual, tangible objects set to lead the way to the future of design (intended as the ability to create new things). These are the focus of a collaboration between Stratasys and five world renowned designers. Russian leaders, women’s underwear, and iPhone cases were among many items on show in Moscow, Friday, as the capital’s 3D Printer Expo got under way. The event at the Sokolniki Exhibition Centre showcased a huge range of 3D printers and their products, including busts of Joseph Stalin and Vladimir Putin, chocolate bars, and scantily clad women. One young woman in bright pink underwear could be seen posing next to her life-like miniature figurine. The exhibition aims to present the increasing quality of 3D printing technologies, and their possible applications to areas such as food, firearms, medicine, home construction, and other spheres. The exposition will continue until October 25. Bacon makes everything better. After an excruciatingly long day two at the Inside 3D Printing Santa Clara conference my body was a little upset at my suggestion that we do it one more time. But I made a deal with it, if my body would let me get moving, then I would imbue it with the healing power of bacon. Bacon really does make everything better. There was so much happening at today’s Inside 3D Printing Santa Clara event that it’s still a little overwhelming trying to parse it down into a single column. I could probably write a novella if I had enough time. With a day that was packed with fantastic workshops, dozens of speakers and an exhibit hall full of some of the industry’s coolest companies, most of the day I felt like I was re-enacting Sophie’s Choice. Sciaky, Inc., a provider of Electron Beam Additive Manufacturing (EBAM) machines and a subsidiary of Phillips Service Industries (PSI) has announced its sponsorship of the second annual Additive Aerospace Summit. Are you interested in 3D design and hobnobbing with the best in the biz? Looking to share your 3D printing enthusiasm, talent, and designs, and to get some tips? MakerBot, manufacturer of 3D desktop printers and creator of Thingiverse, is one of the most dynamic, exciting companies in the 3D printing industry today. Now, they are inviting you to their home city of Brooklyn, NY, for an exciting two days of inspiration, group motivation, and learning on November 15 and 16, for the second annual MakerBot Thingiverse Make-a-Thon.